Not bad for a couple of amateurs. 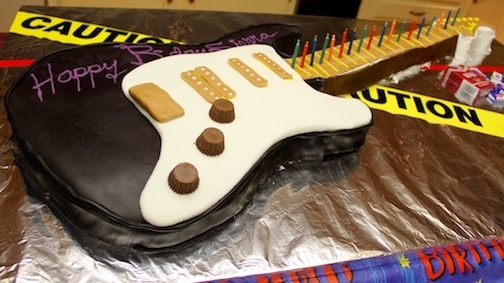 My husband and I made this guitar cake way back before the days of Cake Boss, and Cake Wars. We had no idea what we were doing, and it's far from perfect. It was all worth it when we saw the reaction of our 16 year old and her friends. They were blown away! Said it was "sick"! The full story and directions below. 2. Traced the actual Fender Strat guitar onto butchers paper. 3. Cut it out to use as a template to build the cake. 4. After the cake cooled, he started cutting the pieces to form the guitar shape, trying to use as large a piece as possible for the body of the guitar. 5. While he did that, I rolled out the first piece of fondant. It was black and would be the largest piece on the cake. It was going to be close on getting it to cover the whole cake, so we had to get creative, and make sure we rolled it out to cover only the areas that needed to be black, which meant it got thin in places, so we made sure it was in the areas that would be covered by the white section of the guitar. It was "sick", as the teens put it. When we brought out the cake, everyone was totally blown away. It was life size, and pretty good for a couple of inexperienced cake decorators. Since it was a surprise, along with a surprise party for my daughter, we had to start the cake after she left to school, then have it out of sight before she got home. That gave us about 7 hours. I baked, while my husband traced her actual Fender Strat guitar. He traced it on butcher paper, then cut it out and we used it as a template to build the cake. We happen to have 7 boxes of cake mix we picked up on sale for $1 per box. After the cake cooled, he started cutting the pieces to form the guitar shape, trying to use as large a piece as possible for the body of the guitar. While he did that I rolled out the first piece of fondant. It was black and would be the largest piece on the cake. It was going to be close on getting it to cover the whole cake, so we had to get creative, and make sure we rolled it out to cover only the areas that needed to be black. When my husband and I decided to make this guitar cake, we were not thinking it would take 7 boxes of cake mix, 21 eggs, $60 in fondant, and a full 9 hours with two adults working on it full time. On top of that, because the party and the cake were a surprise, we had to move it into our bedroom for the final decorations. My husband set up folding tables, where I rolled out fondant, while he put the finishing touches on the guitar. We knew this might be one of the last parties we would have for our little girl, so we enjoyed the process and loved the end result. It was better than we even imagined. It's amazing what fondant will cover. I rolled thin long pieces of black fondant to line the rim of the guitar. That made a huge difference in the end result. We lined up the 18 candles on the guitar, sang Happy Birthday, and with no problem at all, my daughter blew out the candles. We ate cake, and were merry. Memories that will last a lifetime! For any questions regarding this cake, don't hesitate to contact thediyeffect.com through the contact us page. Happy Baking!